Walnut ink and a Brause nib on Strathmore Writing 400. 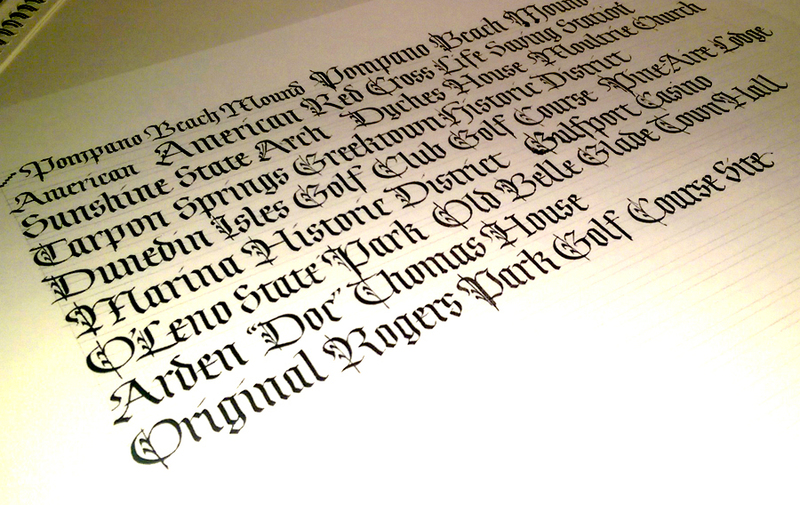 Of all the major hands, I’m least confident about blackletter. This is copyfitting and practice for a personal project. I have little affinity for blackletter styles and clients request blackletter (“Gothic”) calligraphy only a few times a year, so I don’t work on it much. This year my study of the Fraktur exemplars which Yukimi Annand generously shared with me has made work on these historic register certificates more enjoyable. 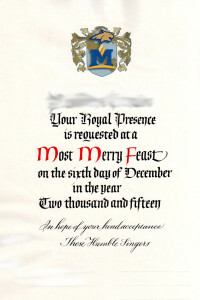 Today I made a couple of faux-medieval invitations for a madrigal dinner. (The invitee’s name is of course quite clear on the original; it will be presented in person later this week.) 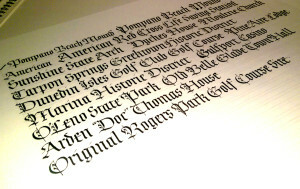 Although the image doesn’t show it well, the paper (80-lb. Strathmore Drawing 400) was tea-dyed. 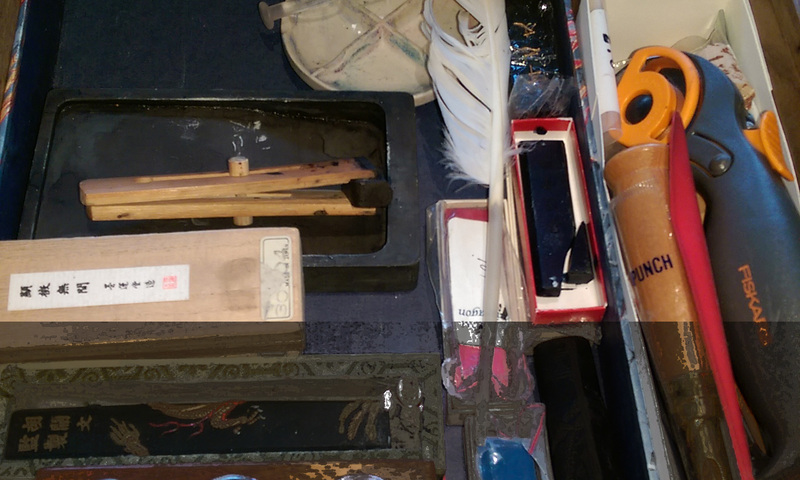 I did a number of trials to determine what papers are suitable for tea dyeing, how long to soak the paper, whether it would be better to print the coat of arms (created in Photoshop for the event) before or after, whether I should letter on the paper before or after tea dyeing, and so on. I printed the coat of arms before dyeing the paper because the inkjet ink is waterproof and I liked the printing better after dyeing. Then I dyed paper by soaking it in a Pyrex dish of Lipton Iced Tea (2 family size bags in a teakettle of boiling water) for 2-5 minutes. In one the earliest trials I put the dyed paper between waxed paper to dry, but this created a pattern (which I liked but didn’t concide with my intention); my final solution was to dry the papers between shop towels sandwiched between large sheets of blotting paper and under a few pieces of corrugated cardboard with a heavy-ish book on top. I wove together two blue ribbons and a gold rattail cord to make the cords that keep the scrolls rolled up. 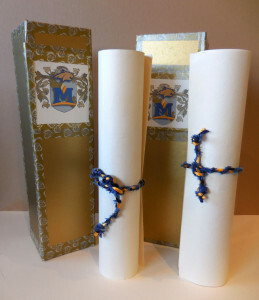 A 9″ x 14″ scrolled piece of paper is rather fragile, so at the last minute I decided to make boxes to hold the scrolls. I used some scrap gold matboard and some more of the washi tape I used for this book in January. The boxes definitely qualify as ephemera; washi tape, at least this washi tape, is not very sticky and doesn’t stay stuck for long.